Give your loved ones something they will cherish this Valentine’s Day. These Tins Of Love are so special, because they are customized by you! 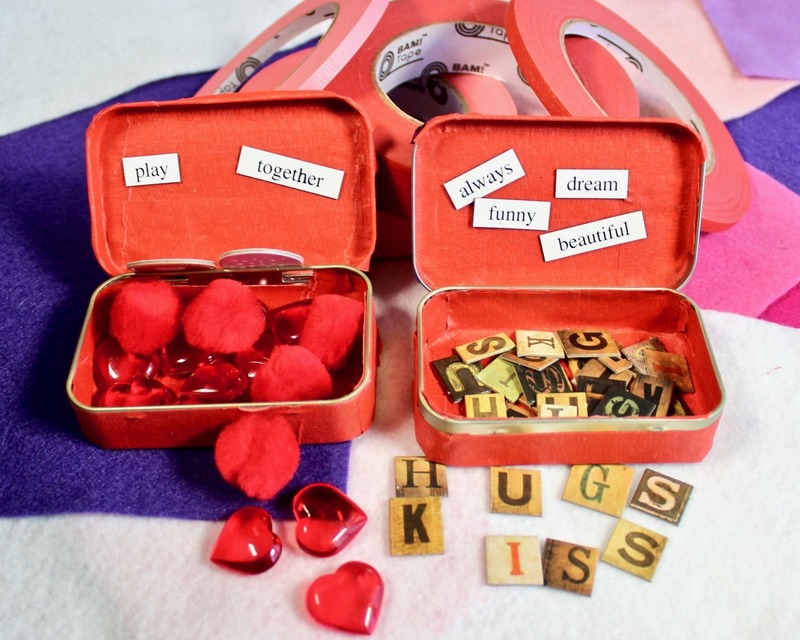 Your tin can hold a miniature game, tiny treasures or perhaps a special love note. This is an easy, yet meaningful project. It would be fun to do at a party or as a class project. Or how about making these beautiful Tins Of Love for a Community Service Project? A small cholcolate and a few hugs would certainly put a smile on anyone’s face! 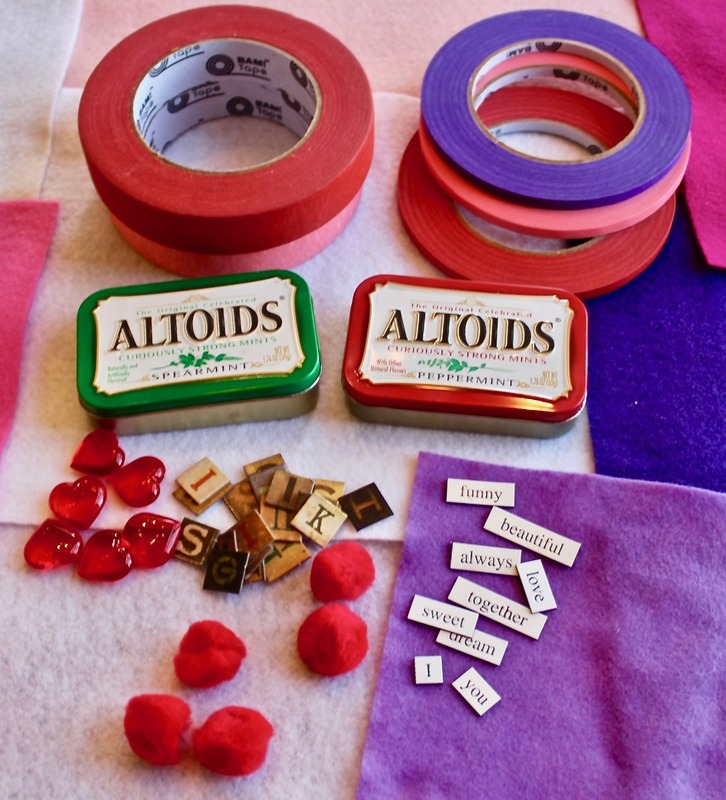 Small items to put inside, we used acrylic hearts, pom-poms, chip-board letters and word magnets from a set we no longer use. Decorations that can include glitter, rubber stamps, markers, stickers, etc. Wipe the inside and outside of your tin with a damp cloth. Any residue, such as mint crumbs, will make it hard for the tape to stick. Dry tin thouroughly. 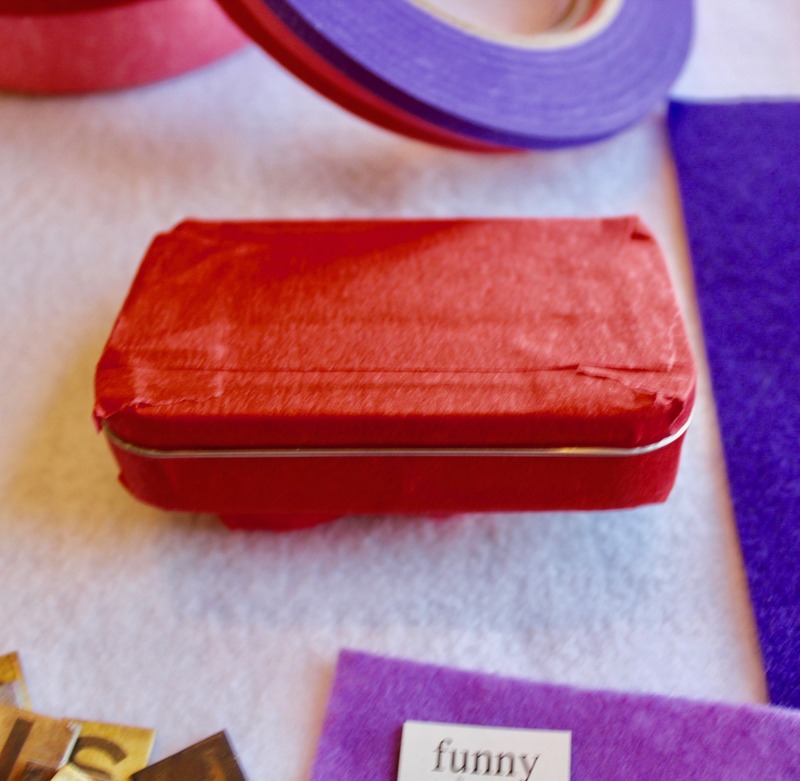 Choose a masking tape base color and cover your tin. Try to be neat and create a layer with smooth edges. Avoid putting tape on the edges of the tin that come together when you close it. Putting tape on those edges will make it hard to open and close the tin. Now let your imagination and love lead the way! Based on the theme for your tin, use rubber stamps, glitter, etc to decorate and fill your tin. Be creative and think about the person who will receive this lovely tin. Will you make a game that you can play with your Grandparent? Perhaps a chocolate and note of thanks for a Veteran? Maybe you are making a tin for your teacher and want to tell her how much you love being in her class! I used acrylic hearts and pom-poms for playing pieces. Skinny tape outlines the playing space. First I covered the tin with red masking tape. I found an old refrigerator magnet set and chose “words of love” from it. I put a few magnets on the outside of the tin, and I wrote “I love sweet you” for a loving message. My tin is filled with extra pom-poms and hearts, but you could put it a different set of playing pieces. I added some yummy chocolates. I put a few more magnets on the inside of the lid. 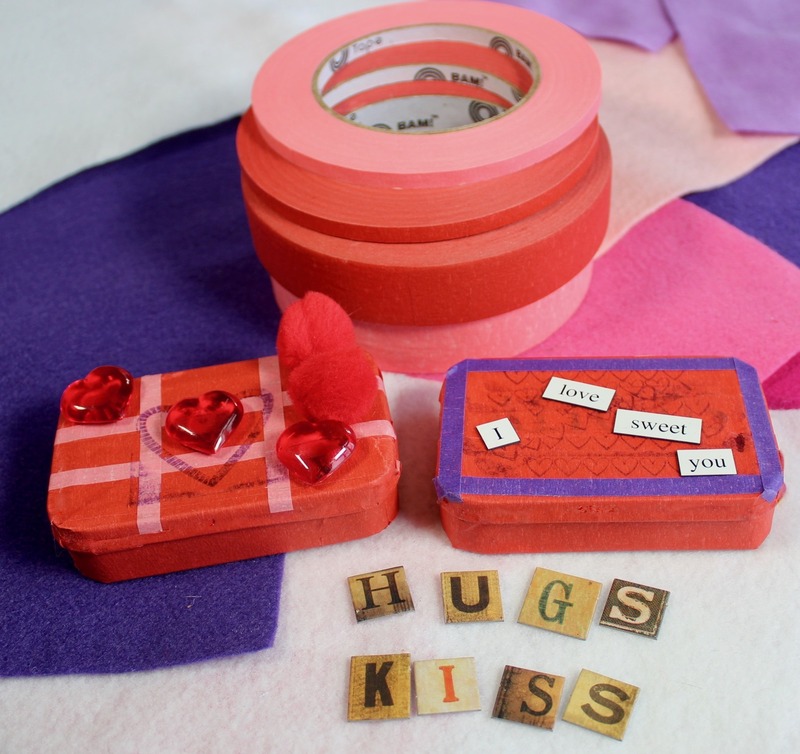 I filled the tin with chip-board letters to spell “Hugs” and “Kiss” several times. And of course I included a a few chocolate Kisses. Now that you have completed a Tin Of Love, or perhaps a stack of them, it’s time to deliver this token made from the heart. You can deliver your tin in person, or you can mail it. Either way, the person who receives it is bound to feel special and loved. Congratulations, you just made someone smile! Visit people who are living in Veteran’s homes, senior homes, or staying in a hospital and do something nice for them. You could read with them, play a song on an instrument, sing, deliver treats, or just have a nice conversation. Leave little messages of love in places where people will find them. this could be at home, at a park or at school. Paint a rock, write it on paper, or write it on a piece of tape. 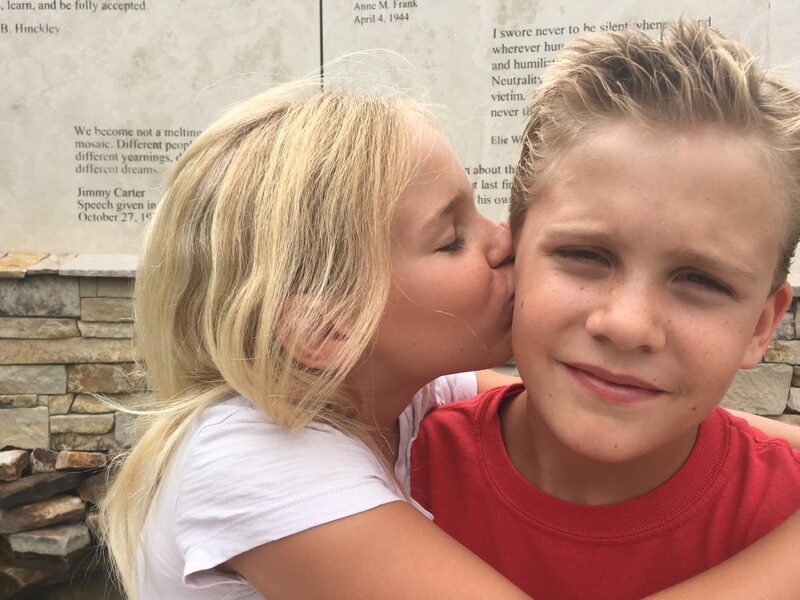 Do special things for the people that you love. Help your parent bag groceries at the store, hold the door open for your brother, bake cookies, or look at family photos with your grandparents.